Bob Alberti is one of the most respected and successful musicians of his generation, and it doesn’t bother him that you probably don’t know that. Alberti grew up in Brooklyn NY, and played New York City through the height of its jazz era, gigging with the great Charlie Spivak Orchestra while still a teenager. He discovered he had perfect pitch at a young age. By the time he was five years old, he was carving out songs he would hear on the radio. His memoir, Up the Ladder and Over the Top, published in 2003, is an immensely entertaining and insightful look into the life of a Hollywood studio musician. He sat down recently to discuss his storied history in the entertainment industry. Martin Lesch: How’d you come to call Hilton Head home? Bob Alberti: We were looking for vacation homes. My wife is a tennis buff and happened to be watching The Family Circle tournament, which at the time was held in Sea Pines. They had glamour shots from the blimp. So the next year we decided to come down and watch it. We were staying at a hotel and decided to go down and have a drink. They had a little jazz trio playing there. I see the musicians milling about and the waitress comes over to tell us she’s terribly sorry but the piano player called to say he can’t make it and the sub hasn’t shown up yet. I said, ‘If you wanna tell ’em there’s a half-baked piano player in the audience, I could maybe fill in until the sub arrives.’ Well, they were in tuxedos, and we looked like we had just gotten off a boat. As it turned out, the sub never showed and I played all night. That got it started, and we came back the following year and bought a villa. ML: You studied with the great Teddy Wilson, the pianist for Benny Goodman? BA: He had a radio show. I was 13 years old at the time, and I called the station and asked to talk to him. I asked him, ‘Do you teach jazz?’ He said he gave classes at the Metropolitan Music School. Here I was, this peanut that was in high school. There were about six people in class and they were all pros. He was probably the best teacher in the world for me. He would critique, but not in a negative way, and at the end, he gave me some of the best advice I ever had. He said, ‘Go listen to everybody you can, and what you like you will retain and what you don’t like you will discard. Eventually whatever you collect from all those retentions will become you.’ No truer words were ever spoken. ML: Do you think Teddy helped integrate music? BA: Yes, very much so. Benny Goodman as well, because he made sure that Teddy played with him at Carnegie Hall back in 1938. ML: What drew you to piano as a child? BA: We had a grand piano. I don’t know how we got it, but it was always tuned. My father was a band leader so I inherited the genes. They found out I have perfect pitch around the age of five. At that time I could hear a song on the radio, and I could go and pick it out on the piano. ML: How did you get into arranging music? BA: I guess sitting on a band bus with the Charlie Spivak Orchestra. It gets to be pretty boring, so I got a hold of a book called My First Arrangement by a fellow named Van Alexander, who is still alive today at 98 years old. What you would do is write an arrangement and send it to him with one dollar and he would critique it and send it back to you. So I would write these things on the band bus and get them back in the mail some time later. I started writing stuff for the band so I had a chance to try these things out and actually hear them. ML: What do you think has been the secret to your success in the music business outside of your talent? BA: Two things. Being in the right place at the right time, and having the wherewithal to dive in and take advantage of what was offered at the time … to see that something is an opportunity and say ‘Yes’, and dive in. ML: People don’t expect this, but musicians are usually people of regime. You went from job to job rather quickly throughout your career. Was that easy for you to do? BA: I knew that was the way the business worked. It was all short term. A steady job was a month. ML: How did you come up with the Tonight Show gig? BA: I was there nine years as the alternate (1974-1983). Ross Tompkins was the regular player, and he was not always the most reliable guy. He would call NBC and say he wasn’t gonna make it. I lived 10 minutes from the studio and they would call me up and say, ‘Get your coat and get down here; you have a 3:15 rehearsal.’ I was also doing Name that Tune which was recording in an adjacent studio. We would start at nine in the morning and finish at three in the afternoon; perfect timing for me to get to the next studio for The Tonight Show. ML: For Name that Tune you were musical director? BA: Yes, I did 167 Name that Tune’s. ML: I love this, but not many people are aware of it. You were also musical director for Hee Haw. BA: Ha ha. Yeah, I don’t pump that out there. ML: Do you consider yourself a jazz purist? BA: It’s my favorite. I also dig classical music: Debussy, Ravel, and Rachmaninoff. ML: Do you think it’s the parents’ responsibility to teach their children about music? BA: I think it’s partially the parents and partially the educational system. 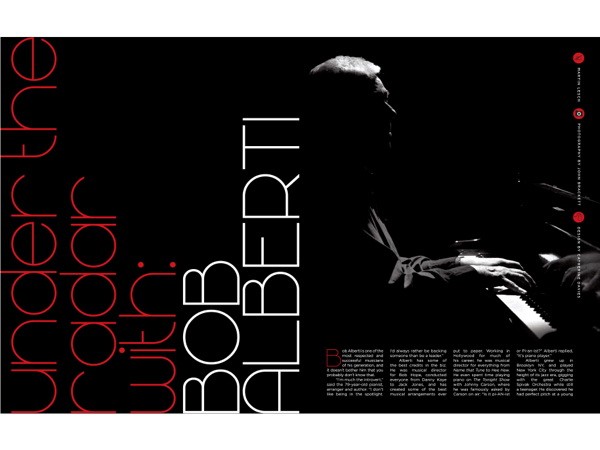 Bob Alberti is the best – great “piano player” and a true gentleman! We plan to drive up fm FL for his Valentine Gig at the Jazz Cor. fine write up…Bob is certainly a world class pianist and human being. Great interview. I learned some things about you, Bob, I didn’t know before. Are you ready for your next bio?